That there is something unique about the San Francisco music scene has been obvious for some time now. One after another, a succession of great bands - The Jefferson Airplane, The Grateful Dead, Country Joe & the Fish, Big Brother & the Holding Co. - have emerged from what the rock generation has called "the Liverpool of the U.S." and more are coming. 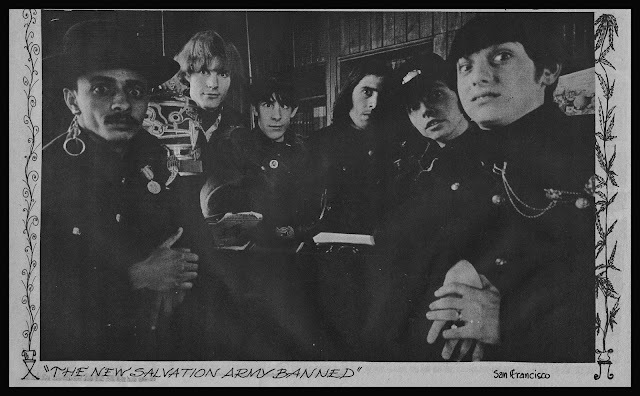 "Music is different here," says Joe Tate, lead guitarist of Salvation, latest in the succession of San Francisco bands to emerge on the national scene. "Tastefully, it's different. It has a flavour that hasn't been heard before. 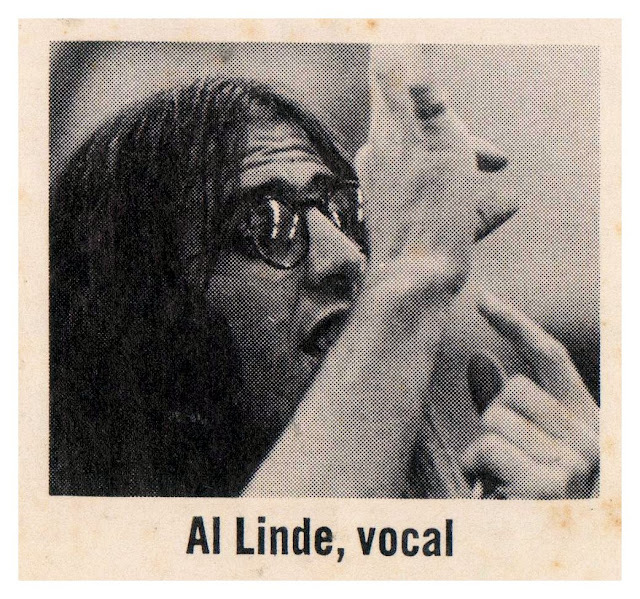 "I would use the word pure," interjected Al Linde, his songwriting-singing associate in Salvation. "Music is purer here. If you're shucking, they know it!" Salvation emerged this past year in San Francisco. 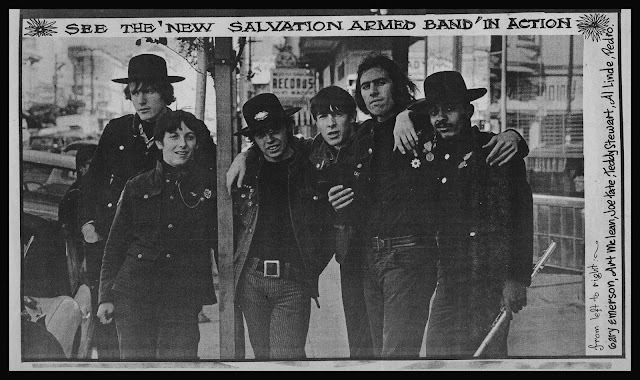 For weeks the band was a feature at the free concerts in Golden Gate Park given every Sunday by local bands under the wing of The Diggers, the Monks of Haight Ashbury who provided free food and concerts all summer. Salvation loved the concerts in the park. "It's our business to entertain." Linde says. "We'd play for Ed Sullivan, President Johnson's press party, any place, if they'd ask us. It's good for music to be there where people are and it's good for them for us to be there." Salvation began when Al Linde, a former harpoon sharpener and garbage collector at the University of Washington in Seattle, met Joe Tate, a cesspool diver and former student at the School of Mining & Minerology of the University of Missouri. "Al and I were running around with a tape we had made and we got a call for a job at the Roaring 20s that started in nine days. 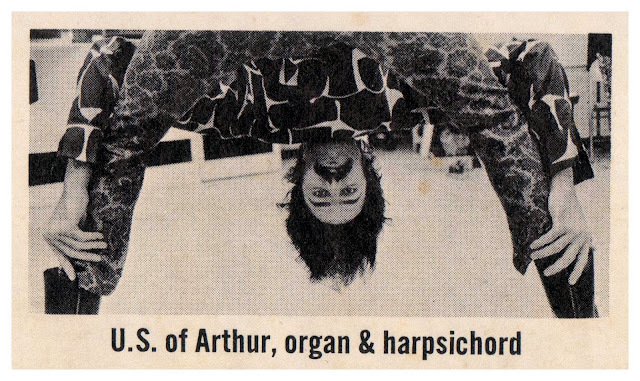 So we learned twenty songs and went to work and stayed there three months." 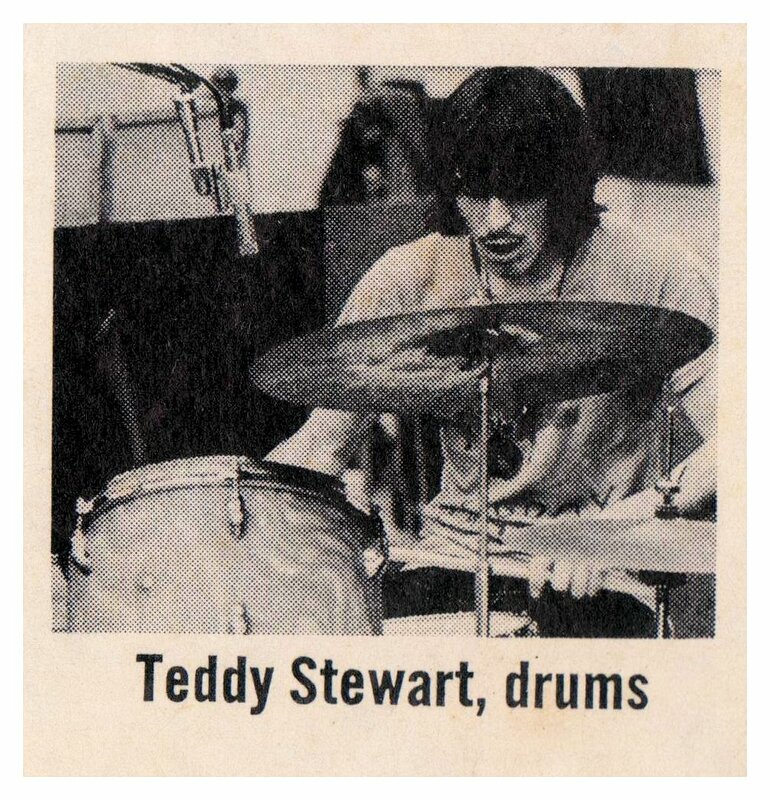 Teddy Stewart, the group's drummer, met Joe outside a bar in Sausalito and U.S. of Arthur (his real name is Arthur Resnick and he went to the University of Minnesota with Bob Dylan) and bassist Artie McLean joined later. "We're growing," says Linde, "but we change all the time. The thing to do is to all grow at the same pace. We have depth and we're growing with each other. We haven't really even delved into what we COULD do yet. We haven't even scratched the surface of each other's talent." The music on the album is a good cross section of what Salvation does. Al Linde refers to it as "the music we've listened to all our lives. Super product. Super square." 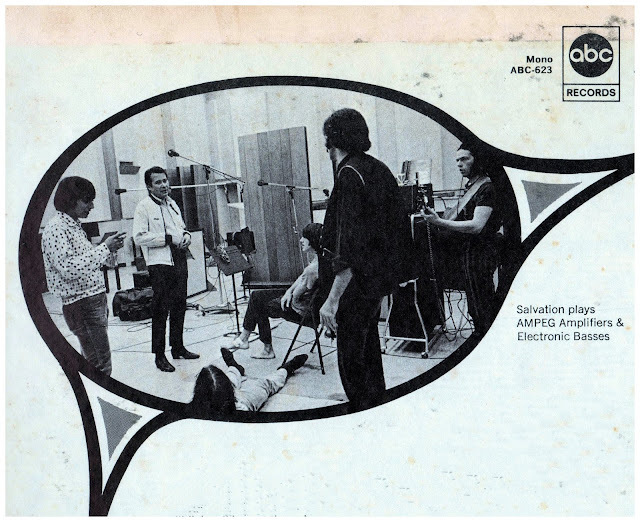 It took them three days in three four hour sessions to cut the album and all the songs are written by Al and Joe. 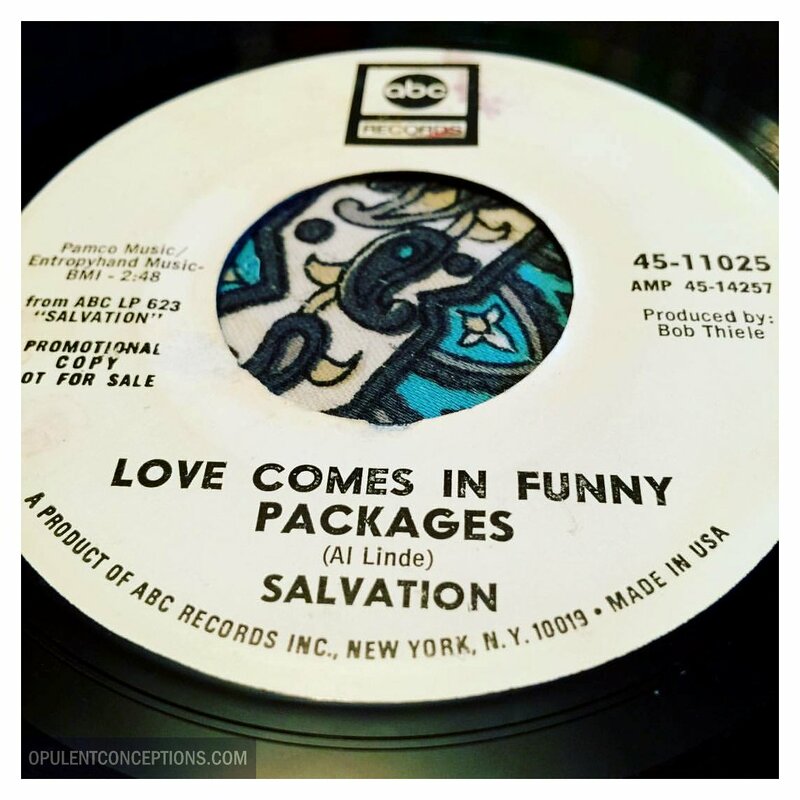 The music, Al says, "Is earthy, commercial, what just comes out of our mouths and souls." 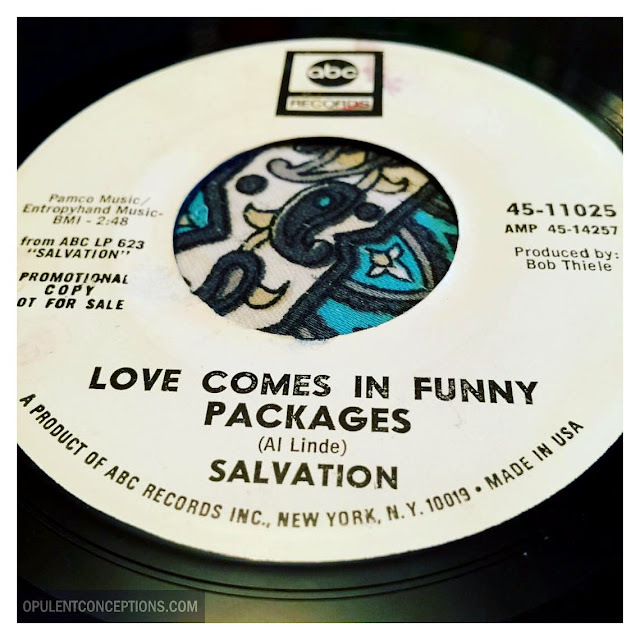 Of the songs on the album, Al wrote "Love Comes In Funny Packages" on "a riverboat in Seattle. It's in B-flat. It's just a corny cat digging a chick on the street." 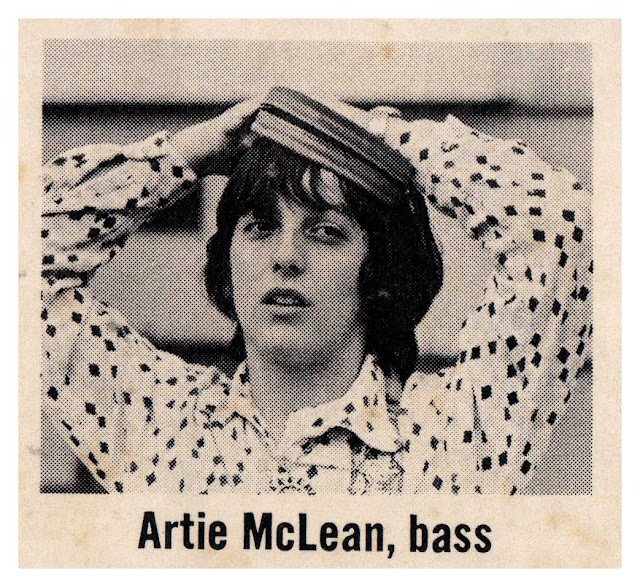 "Cinderella" (one of the group's most successful songs in performance) is "a true rock 'n roll song," Al says. "The lyrics are cute." 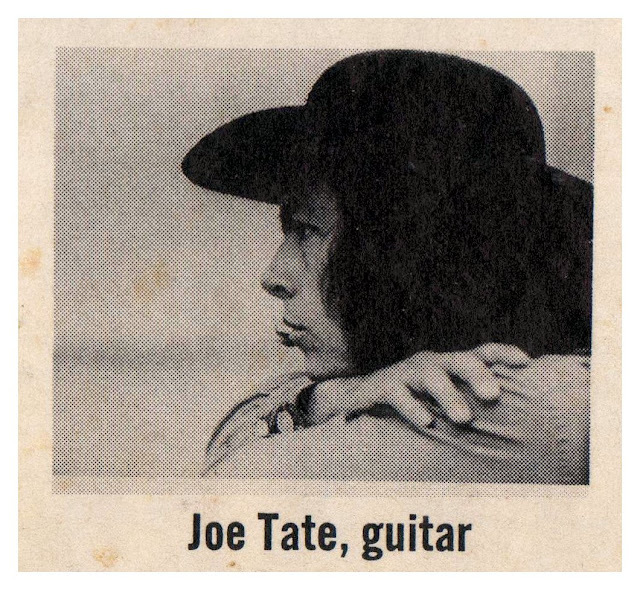 Joe Tate adds, "It's a knock-out rock 'n roll song." "More Than It Seems" "is our answer to Motown," Joe says. "This shows another side of Joe's guitar playing," Al adds. 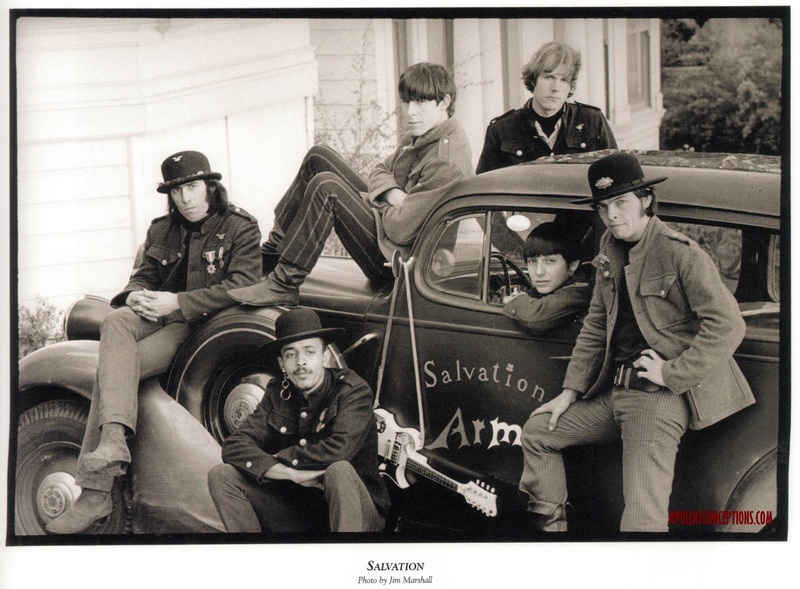 "Getting My Hat" "is kind of rhythm and blues variation of everything we've ever heard. It's one of our true songs and has 'fours' in it and is dedicated to all those groups that have ever done fours in jazz." Al says "G.I. Joe" is a rock-and-rollee! It is good time music. I was talking to myself. I didn't write it or anything. I just sat down and played the whole song through once and I just knew it! I never had to do anything to it after that." "Think Twice" "is a very free song. Every musician gets a chance to express himself in it and it ends in a jam." Joe points out that Al playes harmonica on this one. "She Said Yeah" "is real hard rock. It's really fun." "The Village Shuck" is "a good time song, a happy go lucky song. Joe plays electric mandolin on it. It's bizarre," Al adds, "I sing it in an English-Western accent, like something out of the 30s, the Victorian times." "What Does An Indian Look Like" is a fun song, too. "It's the next thing between rock 'n roll and Village Shuck." Joe says. 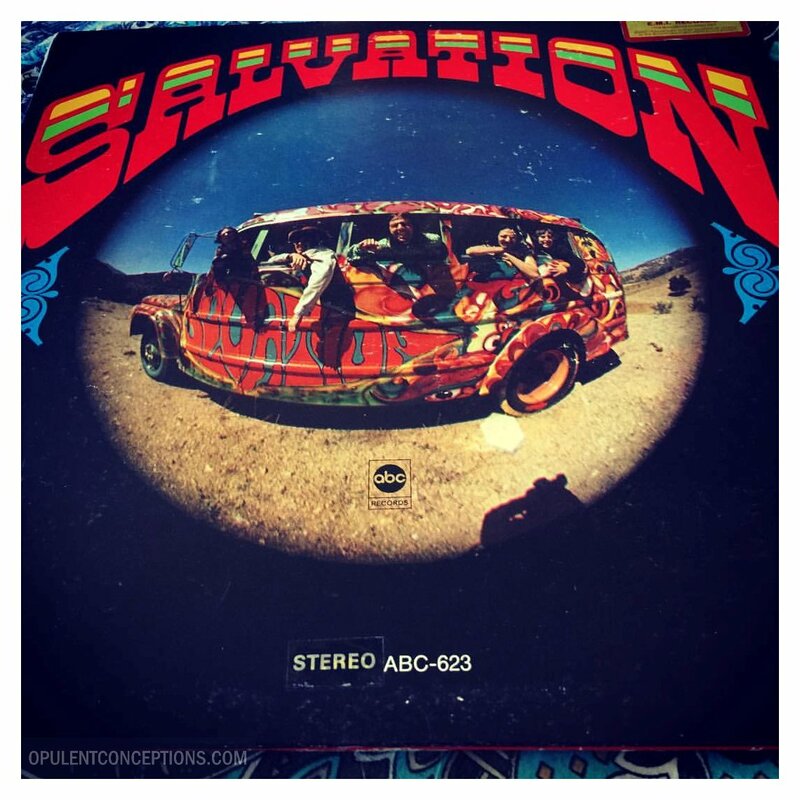 As the album was being released, Salvation was in New York and planning on driving back to San Francisco in their bus, "a 24 passenger 1963 Ford school bus." It used to belong to a church and the band has tranformed it from it's original image quite successfully. Joe designed the big metal hand which is one of it's salient features. 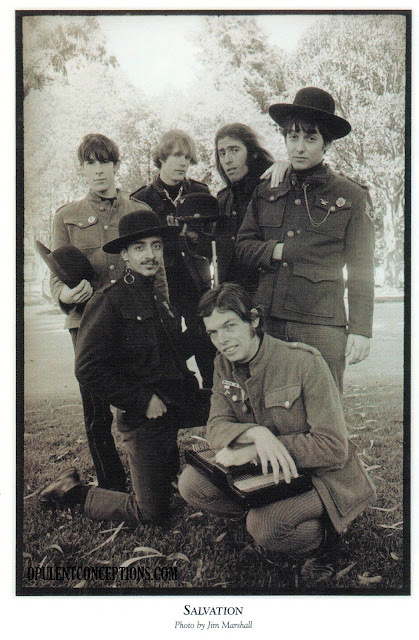 Some of the pictures Jim Marshall took of the group followed a mad bus ride in Los Angeles. The deepest conviction of Salvation is that they are guarded by the mighty hand of God in all driving adventures. Like their music, the bus is impromptu and joyous.